During his lifetime Milton Menasco created a large body of works. 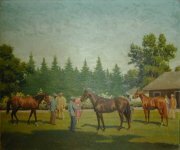 He was commisioned by the owners to create portraits of such thoroughbred racing greats as Secretariat, Citation and Exterminator. The following oil paintings are but a small sample from the estate of his late wife, Mrs. Florence Menasco. 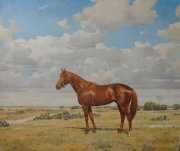 The first part of this selection contains works of equestrian art, including some preliminary oil studies. The second part shows works with other themes, such as landscape and seascapes.